Alas, I find that I’m frequently blamed by SWLing Post readers who cite this blog as the reason they spend so much money on radios. But for the record, I’d like you to know that such spending is actually a two-way street! 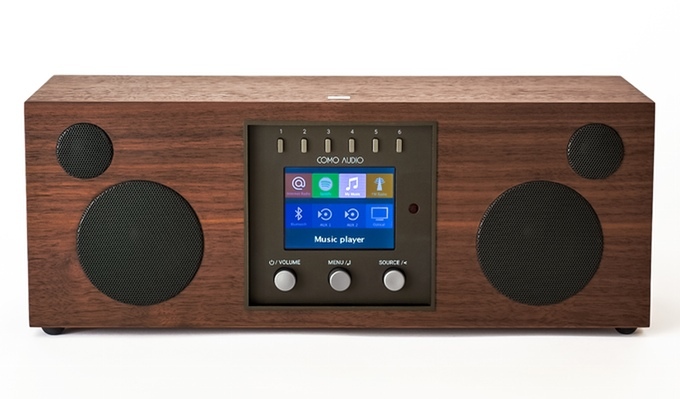 A couple of days ago, Post contributor Robert Gulley sent me a link to a cool Kickstarter campaign for two new multi-format digital radios: the Solo and the Duet by Como Audio. 4 High-Res inputs: 2 analog, 1 Optical, and 1 USB. It even has a “high-performance” FM tuner and is DAB+ compatible, especially great if you live in Europe. It also sounds like they’ve spent time designing a proper acoustic chamber/chassis and are fueling a 3″ woofer and 3/4″ dome tweeter with a 2 X 30 watt RMS amplifier. This radio should pack some audio punch. The only obvious thing I see missing on the Como Audio WiFi radios is an internal battery. Still, after watching the video and reviewing the specs, I backed the campaign to receive a walnut Kickstarter Edition Solo. If all goes well––and I never actually expect a campaign to produce and ship a product in the amount of time they expect––they may be shipping the radios as early as October. The campaign has already met it’s goal of $50,000 and is now stretching for $100,000 with more incentives. So, I didn’t really need another WiFi radio, but thanks to Robert’s email––yep, I bought one! Now the only question remains: can you actually make impulse purchases on Kickstarter? I think I just proved that you can. This entry was posted in New Products, News, Radios, WiFi Radio and tagged Como Audio Duo, Como Audio Solo, Internet Radio, Kickstarter, Robert Gulley (AK3Q), WiFi Radio on June 13, 2016 by Thomas. The Como radio is using the same aggregator Sangean is using – Frontier. Interestingly if I ask a question from Frontier – Vtuner replies. Are they the same company? For those that don’t know, Tom DeVesto is the guy who was one of the key principals — with Henry Kloss — behind Cambridge Audio and was the founder, president and chief designer of Tivoli Audio. So, the man does have some bona fides and a reputation for successfully putting start-ups into place. My NetWorks wifi stereo is a great “piece of audio kit” and is still going strong in my living room, eight years after I bought it. I’m intrigued by the Como units, but with the NetWorks unit working and sounding so good, I wonder where I’d put them? If I didn’t already have my Sangean WR-22, then I would have thrown my money towards this Kickstarter. Instead of VTuner, I wished they went with TuneIn Radio and also thrown in iHeartRadio support. However, there’s still Bluetooth and Google Cast built in so users can still use those services with a smart device or PC. Thomas, do you know which internet list the radio uses (ie TuneIn)? It would also be great to have a SiriusXM app, will that be available? I think TuneIn and SiriusXM availability would get my support. Hi, Dan! I actually submitted the same question to the Como team on the same day I committed to the project. I’ll reply when/if they confirm which aggregator they’re using. 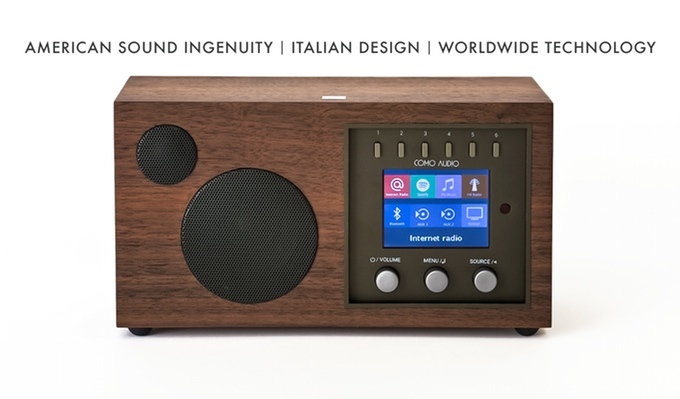 The Como Audio radios will be using VTuner as their Internet station aggregator, according to founder Tom DeVesto’s July 7th post in the comments section of their Kickstarter page. What! no Digital Radio Mondiale? OK, I bought in. I hope this is better than WiFi radios I’ve had in the past. They have been unreliable, losing connection and requiring frequent restarting. I expect the audio to be quite good, at least on par with the Tivoli. I hope that advances in the streaming technology and the fact that my internet speeds are very high and my router is improve, will combine to take away the frustration I experienced in the past. Ha! Well, you know what they say about paybacks! I bought the Elad FDM-S2 a few years back because of your reviews . . . . glad I could return the favor! !